April 1, 2020, marks the kickoff of the 2020 Census. This process of counting will ensure that the political power, health, and safety of every community is maintained or enhanced in the upcoming decade. But communities that don’t get fully counted in 2020 will miss out for the next ten years. NOW is the time to get involved. The Census counts. So do you. 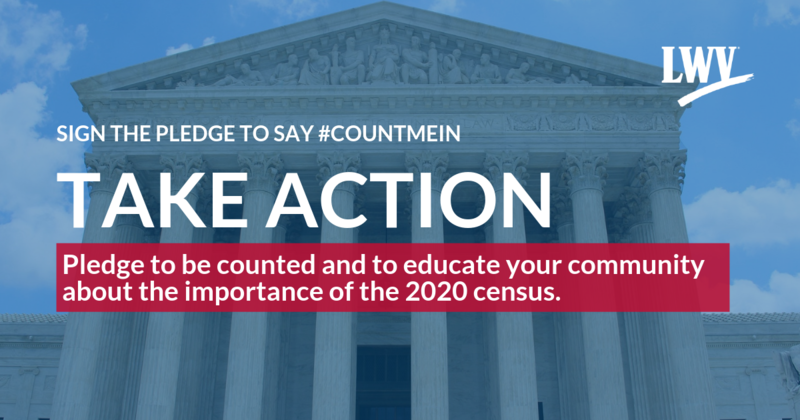 Pledge to be counted and to educate your community about the importance of the 2020 Census. In the Senate, the For the People Act faces an uphill battle. But we know that because of the tremendous work we’ve already done to mobilize the effort around this bill, that we can move this forward. It is important for the American people to understand what issues their Senators have with this legislation. The American people deserve to know why their Senators don’t want to ensure that every eligible citizen being able to register and vote. They deserve to know what harm will be caused by taking the politics out of redistricting. Finally, they deserve to know why we should be allowing big money interests to hide in the shadows and influence the votes of the American people. The For the People Act has now been introduced in the U.S. Senate! This historic legislation will modernize our election system, reform redistricting, and restore the Voting Rights Act. The extraordinary and comprehensive reforms in the For the People Act are good for all Americans and deserve bipartisan support. That’s why we need YOU to contact your Senators and express your support for this legislation. Help us build momentum to move this bold legislation forward. Contact your Senators today! The extraordinary and comprehensive reforms in HR1 are good for all Americans and deserve bipartisan support. That’s why we need YOU to contact your Representative and express your support for this legislation. Help us build momentum to move this bold legislation forward. Contact your Representative today! In addition to emailing your Representative below, please call the Capitol switchboard at (202) 224-3121 and tell your Representative to Vote Yes on HR1 this week! Corruption occurs in Washington when wealthy donors and powerful interests use political money to buy influence from officeholders. Creating a new public financing system, will end Washington corruption. Greatly reduce the power and influence of big money funders. They would be far less important in elections and have far less influence over government policies if candidates can obtain sufficient campaign funds elsewhere. New legislation from Congress, HR 1, will modernize our election system, reform redistricting, and restore the Voting Rights Act. But we need your help to ensure that a key provision reducing the undue influence of Big Money in our politics is also included. Contact your Representative and ask that a small donor public financing system is included as a priority in HR1. Congressional districts should be drawn fairly to reflect the will of voters—not to serve the special interests of politicians. Political and racial gerrymandering distorts and undermines our democracy by taking power away from the voters. When district lines are drawn to protect elected officials, the voters lose every time. 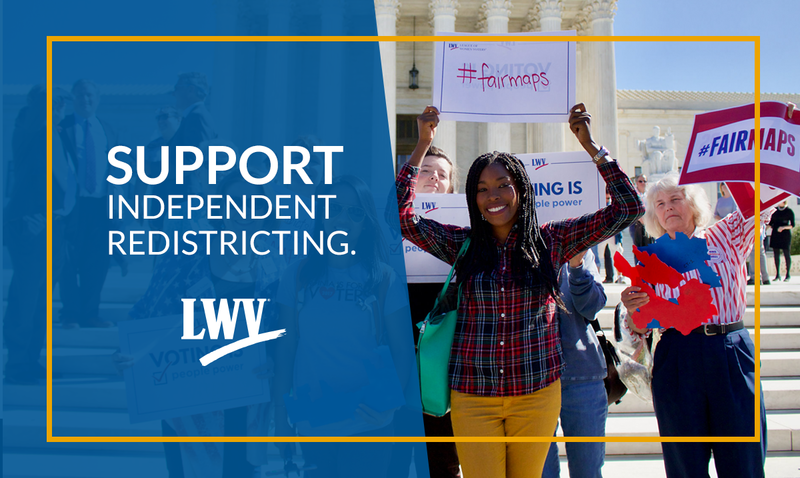 The League is working to end this practice and create fair districts through independent processes. By including civilians in the process, district maps are created to better reflect the communities and putting the power back in the hands of the voters. In Utah, the League is supporting Proposition 4 which creates a seven member independent redistricting commission to draw state legislative and congressional maps. In Colorado, the League is supporting Amendments Y and Z which would establish redistricting commission for state legislative and congressional redistricting. In Michigan, the League is supporting Proposal 2 which transfers the power to draw congressional and legislative districts to a 13 member independent redistricting commission. In Missouri, the League is supporting Amendment 1 which ensures that neither political party is given an unfair advantage when drawing state legislative and congressional maps. Now is the time to support this process before the next round of redistricting. When President Lyndon B. Johnson signed the Voting Rights Act (VRA) into law 1965 he called the day ''a triumph for freedom". The VRA outlawed discrimination in the voting booth, regardless of race or language, and is a cornerstone piece of legislation ensuring every American has the right to vote. Unfortunately, the 2013 Supreme Court ruling in Shelby v. Holder, overturned an essential provision of the VRA which has led to countless attacks on the voting rights of Americans. Congress currently has before it various proposals to restore the Voting Rights Act but has taken no action in spite of mounting evidence of voter discrimination. Every day that Congress fails to act Americans are at risk of finding new barriers at the polls. As voters across the country prepare to vote in this year’s critical midterm elections, we will not remain silent as the voting rights of Americans remain at risk. Join us as we tell Congress to restore the Voting Rights Act. Last week, the House Oversight and Government Reform Committee for held a hearing on the inclusion of a citizenship question on the U.S. Census. The League was pleased to see Chairman Gowdy, Ranking Member Cummings and the rest of the committee take this issue seriously. But the architect behind the inclusion of the proposed question, John Gore, Acting Assistant Attorney General for the Justice Department's Civil Rights Division was a no-show. The Committee should continue to shed light on the process and demand the documentation and answers justifying the decision to include this question. The last time the Census included a question about citizenship was in 1950, well before the passage of the 1965 Voting Rights Act (VRA). There is no justification to the Department of Justice’s claims that adding a citizenship question is necessary to enforce the VRA. The American people deserve to know the motivations behind including the citizenship question. The League believes including a question pertaining to citizenship in the 2020 Census will cause participation to plummet and threaten the accuracy of the Census. Census data is not only used to draw state and congressional districts based on population, but it is also used by local governments to plan for public safety and make investments in the future of their communities. An undercount of persons in any given area could result in inadequate disaster responders, insufficient resources for transportation, education and impacts to the overall health and safety of communities. Send a message to the committee members and tell them to remove this question from the Census. The health and safety of our communities depends on it. Congress is on the brink of voting on a reckless proposal to amend the constitution in favor of a balanced budget. This dangerous proposal is a threat to our democracy and would throw our economy out of balance. Moving this legislation forward could force the U.S. into a recession, causing job loss and long-term growth. Cuts to balance the budget will come at the expense of working families and those in need of public assistance programs like Medicaid and Social Security. And it would hurt working families by sabotaging our economy -- and making recessions slump deeper and last longer. Your voice can make a difference with your Representative. Call or email your Representative today and tell them to vote NO on a Balanced Budget Amendment. Moving this legislation forward could force the U.S. into a recession, causing job loss and hurt long-term growth. Cuts to balance the budget will come at the expense of working families and those in need of public assistance programs like Medicaid and Social Security. And it would hurt working families by sabotaging our economy -- and making recessions slump deeper and last longer. It’s time to stop the violence. Legislation with common sense solutions to prevent gun violence will protect our children, our citizens and help restore our public confidence. Tell Congress to move forward with common sense gun legislation. Add your voice to that of the millions of children, parents and concerned Americans calling on Congress to move legislation that ends the gun violence that is plaguing our nation. Some of the proposed solutions include closing the gun show loophole, increasing penalties for straw purchases of guns, banning assault weapons, placing limits on high capacity ammunition magazines, and funding research to report on gun violence in America. Curbing gun violence is a critical matter of public safety and public health. Tell Congress this issue is too important to ignore any longer and that common-sense solutions to gun violence will save lives. U.S. Commerce Secretary Willbur Ross has chosen to include a question on the U.S. Census pertaining to citizenship. Including this question on the Census will discourage participation and impact the data collected in every community across the country. This decision is bad for the census, bad for our communities and bad for America. The Census occurs once every ten years, so it is imperative to get the most accurate count. Every community relies on Census data — from apportioning our national representatives to making decision about public safety and neighborhood resources — this information impacts every aspect of our lives. A fair and accurate count lets our leaders and businesses make sound investment decisions that keep our communities thriving. Including a citizenship question on the Census undermines the rights of eligible voters and threatens a process vital to our democracy. We will do everything in our power to correct this issue before it’s too late. Sign our petition to say you stand with the League as we fight back against this decision. It’s time for our leaders in Congress to reset the policy debate and pass the Dream Act. When President Trump ended the Deferred Action for Childhood Arrivals (DACA) program last year he created a crisis. It’s time for Congress to resolve this crisis by passing the Dream Act to ensure that 800,000 dreamers are protected. Dreamers are Americans and they belong in America. Congress must step up and take immediate action to protect them. The Dream Act has broad bipartisan support and sponsorship. 87% of Americans are in favor of passage of the Dream Act. As a country of immigrants, we are made stronger by our diversity. This is a moment of our truth for our country. It's time for our leaders in Congress to choose the values and ideals that this country holds dear. They must stand for those that are working hard, paying taxes and contributing to our society on their path to American citizenship. 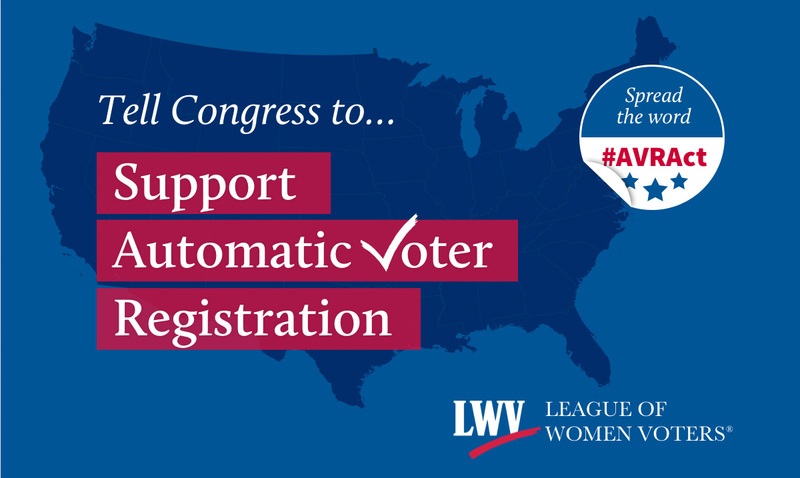 Stand with the League of Women Voters and contact your Senators and Representatives. They must pass a clean DREAM Act to protect, not turn away, the 800,000-young people who were brought to the United States as children. We can and we must do better to be vigilant about speaking out against racism. We must stand up as a nation and say this is unacceptable. Across the country, there has been a concerted effort in many states to stop some voters from voting, or to make it much harder for them to participate. Legislators and election officials have purged existing voters from the rolls, made cuts to early voting, reduced polling places, put in place strict voter photo ID laws and levied onerous voter registration restrictions. We remain committed to fighting suppression tactics that threaten our democracy and the right to vote. Throughout the 2016 election cycle, the League worked to make sure voters impacted by new laws were aware of these restrictions. In Ohio, the League made thousands of phone calls to inform voters about that state’s purge. In Virginia, the League conducted outreach so voters knew how the state’s new voter photo ID law might affect them. In Kansas, the League fought tirelessly to protect the rights of voters caught in the crosshairs of the state’s illegal and discriminatory attempts to restrict voter registration Across the country, thousands of League volunteers served as non-partisan poll observers, staffed voter protection hotlines, and made sure get-out-the-vote phone banks reached as many voters as possible. I am joining with the League of Women Voters to honor, defend and protect our right to vote. Immigrants have helped weave the fabric and identity of our nation. It’s time to help those living in the shadows to become a part of our great nation. The acceptance and allegiance of more citizens will only work to strengthen our nation and our society. Add your voice to the pledge. Citizens United opened the floodgates and secret money now flows from corporations, unions, non-profit organizations, and other entities into election campaign ads. It’s time to restore transparency to our elections – join us as we pledge to shine a light and work to dry up the flood of secret money in political campaigns! Pledge to Protect the National Voter Registration Act! If the opponents of the National Voter Registration Act (NVRA) have their way, the mission of the League of Women Voters is in jeopardy. The case before the U.S. Supreme Court endangers the League's work of running independent voter registration drives. The NVRA streamlined the numerous state laws that hindered citizen-led registration drives, and a decision against the NVRA would leave the voter registration process vulnerable to new forms of political manipulation. The League and our community partners are often the only effective way for many new voters to get registered to participate in our great democracy. The League of Women Voters has been at the forefront of efforts to protect, air, land, and water resources for many decades. The League is a strong supporter for health and environmental protections, and started studying environmental issues soon after our founding over 90 years ago. We remain committed on working to protect the environment by reducing pollution that endangers public health and worsens global warming. But we can’t do it alone – we need your help. Please pledge to help us protect our future generations by fighting attacks on the environment. The Voting Rights Act (VRA) of 1965 is an essential part of American democracy. It ensures that every American citizen, regardless of race, has an equal right to vote.